There are few weak points with this Gigabyte 270 board. It's quick, reasonable value, is packed full of features. Only some SATA and USB port foibles could prove annoying. We were looking for affordable Z270 chipset motherboards and Gigabyte sent us the Aorus Z270X-Gaming K5. It’s still quite expensive, but is it worth buying? 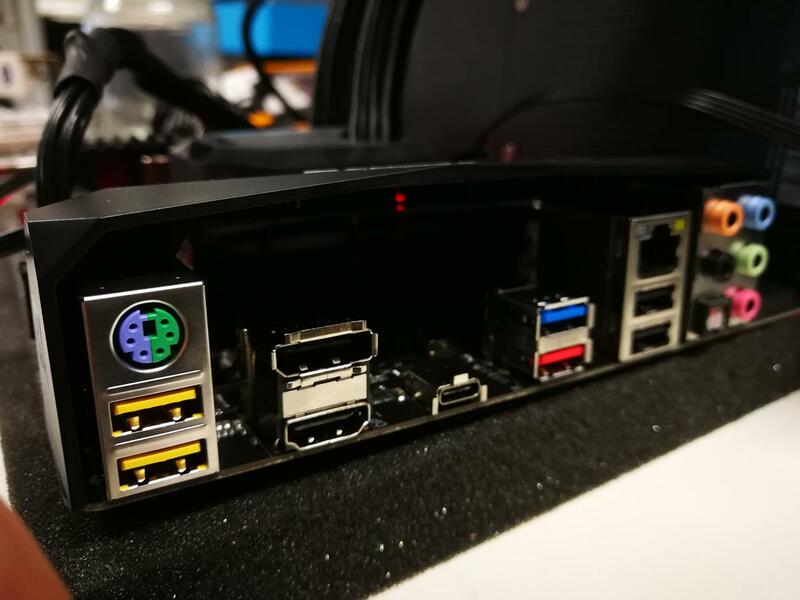 We love our Test Rig – it’s based on Intel’s Z170 chipset but it has great features for using as a test bench – not least on-board buttons for power and rebooting. However, it’s expensive and these features are irrelevant to most buyers who will be locking their motherboard away in a case after purchase. As usual with our component reviews, if you’re a hardened overclocker, look away now. There are plenty of sites that will drill down into every detail and every level of performance of this board across multiple pages. Here we’re just saying whether it’s worth buying or not for the common or garden punter. Gigabyte Aorus Z270X-Gaming K5 Socket 1151 motherboard (F7a BIOS), 4GHz Intel Skylake i7-6700K CPU, 2 x 8GB Corsair Vengeance LPX 2400MHz C16 DDR4 RAM, Samsung 960 Pro M.2 hard drive, Corsair H80i v2 Hydro Series CPU cooler, Corsair Platinum Series AX1200i 1200W Digital ATX Power Supply, Nvidia GeForce GTX 1070, Windows 10, Dell 2715PQ monitor. Even if you plan to lock up your motherboard in a case and never see it again, it’s comforting to know that it looks good (it’s a mark of quality if nothing else) and the Aorus does that. Turning it on lights up many elements (including the stylised heatsinks) making the whole thing look pretty awesome. If you hae a window in your case, you’ll spend at least some time ‘mirin it. Looks high quality and has shiny lights too. The ‘armoured’ PCI slots are joined by armoured RAM slots on this board – that might be a bit overkill but anything that adds to a motherboards strength and reliability is good in our book. The I/O ports are covered by a metal protector too which can help minimize damage. We liked seeing the additional M.2 slots on Gigabyte’s boards, there are now two plus a U.2 connector so you can start thinking only in speedy NVMe PCIe hard drive terms now. Most of the board layout is sensible but we do query having all of the SATA ports facing off the back of the board underneath the primary graphics card – they’ll be tricky to reach in some cases. All of the SATA ports are rear facing and underneath the graphics card. There are a good selection on ports on the I/O plane but things get confusing fast. Out of seven USB ports, one is Type-C and 3.1 compatible; the rest are Type-A and include two USB-2, two USB 3.1 Gen 1 ports, one USB 3.1 Gen 2 port (which is above one of the Gen 1 ports). It’s good that the backplane is labelled but even it doesn’t explain which flavor of USB port is which. Seven USB ports with five different flavours. 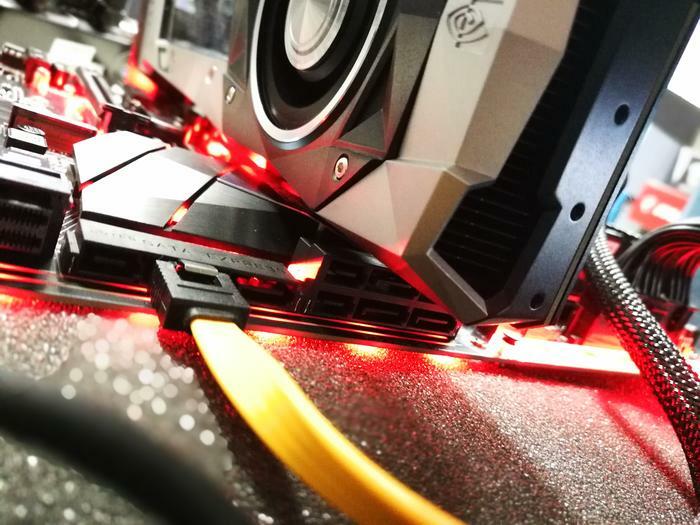 A special shout out goes to the G-Connector which lets you connect all of your case’s front panel buttons into one connector which then plugs into the motherboard. Having to do this with individual wires can be a nightmare. There’s also an HDMI port and a DisplayPort for on-board graphics. But using a well-featured board like this without a decent graphics card seems a bit pointless – unless you’re a an overclocker who’s looking to keep things simple. There are many audio features which are beyond the scope of this review. If you’re interested in such things check them out here. We’re big fans of Gigabyte’s UEFI/BIOS. While there are many settings for hardened overclockers to tinker with, the primary performance tweaks are all handled automatically. Switching on your RAM’s XMP profile is simple (this is the one tweak that absolutely everyone should do). But most of all we love the automatic overclocking feature called CPU Upgrade. With this you simply choose how fast you want your processor to go and the motherboard sets everything up automatically. It’s stable, easy, no fuss and provides a decent performance kick. With our 4GHz Core i7- i6700K Skylake processor it ramps up speed from 4GHz to 4.6GHz. With a Kaby Lake i7-7700K it pushes it from 4.2GHz to 5GHz. 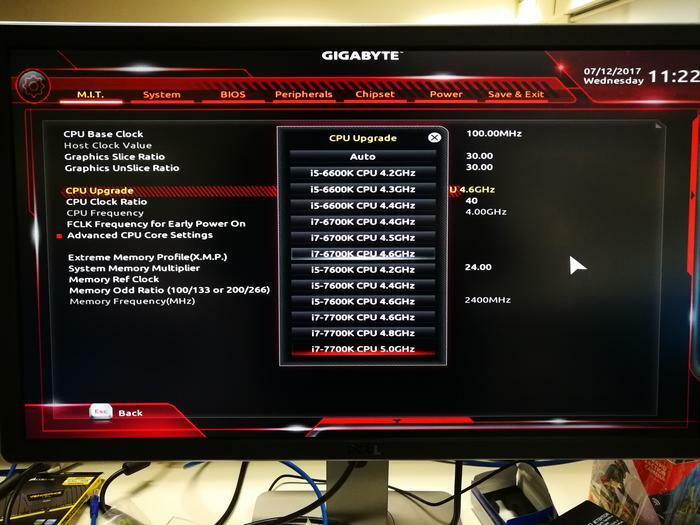 Gigabyte's automatic overclocking settings make performance boosting a breeze. There’s also the DualBIOS chip which has come to our rescue in the past – if you somehow corrupt one BIOS it will fall back to a backup one without bricking your board. 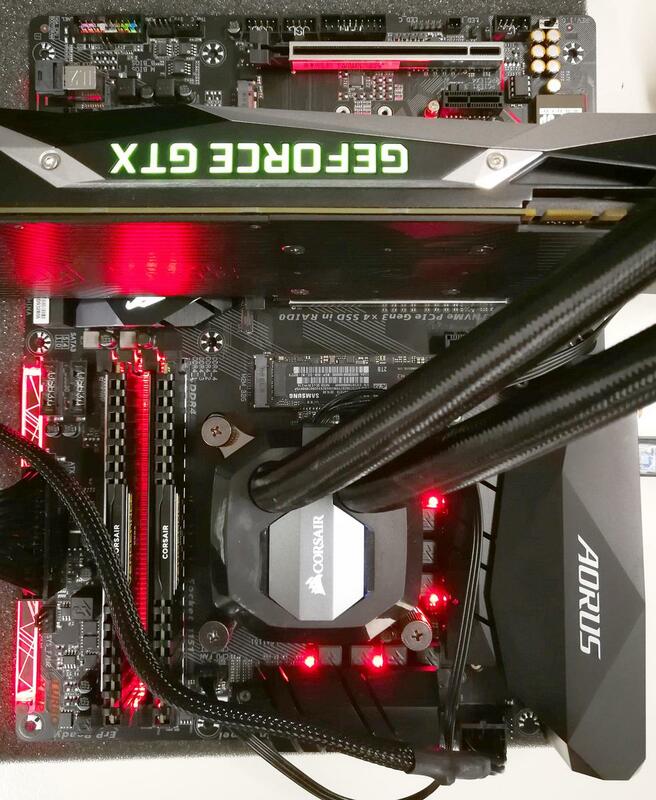 In PC Mark 8 the Z270 Aorus nudged ahead of our Z170 Designare scoring 4,088 in PC Mark 8 over 4,040. Pushing things up to 4.6GHz saw scores of 4,355 and 4,290 respectively. That’s quite a nudge but not quite as fast as the Designare. Still, it performed better than the Asus ROG Strix which couldn’t handle any overclocking without using very high-quality (and expensive RAM). In our new PC Mark 10 test it pushed ahead of the Designare by scoring 6,243 over its older sibling’s 6,036. However, at 4.6GHz the older sibling caught up again by scoring 6,541 to the Aorus’ 6,547. Based on this limited information we saw that the Aorus Z270 runs faster at stock speeds than the Z170 but when pushed to overclocking speeds, the Designare caught up. More importantly, it means this board offers slightly-better performance than the Designare did for some $60 less. In 3D Mark’s Time Spy test, there was little difference (most work is done by the graphics card). The Designare scored 5,590 (stock) and 5,688 (4.6GHz) while the Aorus also scored 5,590 (stock) and 5,672 (4.6GHz). So basically identical. We’re still broadening our library of motherboard reviews, but we can still say that this is a solid, well-featured board with decent performance. If you’re regularly swapping out SATA drives and USB devices, you might get frustrated with the port positioning but beyond that, at around $270, it’s a good bet.